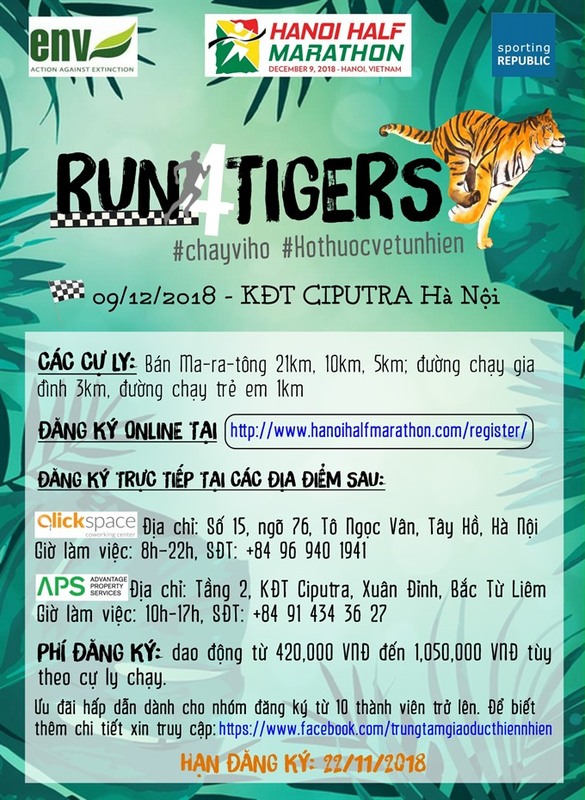 HÀ NỘI — The Hà Nội half marathon, named “Run for Tigers”, is scheduled to start in the Ciputra urban area in Hà Nội’s Bắc Từ Liêm District on December 12. The event will attract the participation of more than 800 runners from 43 countries and territories competing in 5km, 10km and 21km runs as well as a 3km family fun run and a 1km run for children. It aims to raise public awareness on tiger protection in Việt Nam and encourage the community to commit to not using products made from tiger, thus helping to put an end to the hunting, farming and trade of tigers in the country. Runners can register online at www.hanoihalfmarathon.com/register/ before Thursday, or enroll directly at Clickspace, No 15, Lane 76, Tô Ngọc Vân Street, in Tây Hồ District, Hà Nội or at APS, second floor, Ciputra urban area, Xuân Đỉnh, Bắc Từ Liêm District. The event’s proceeds will be used to support tiger conservation activities in Việt Nam.